French Christmas recipes for a Joyeux Noêl. Delicious classic dishes to bring the joy of Christmas to your table. As with all French recipes they are so much better when fresh seasonal ingredients are used to make them and when buying your meat or poultry, if possible, buy the best you can afford. Goose used to be the most traditional Christmas feast but nowadays the turkey is most popular everywhere. The Christmas markets are a sight to behold in France and you can buy a fresh bird with all the trimmings you will need. Of course you can still buy a chicken for Christmas dinner and it is still one of my favorite dishes. I do try to buy a fresh one at Christmas if possible as the flavor is so much better. You will also find a good variety of seasonal vegetables to accompany your chosen meats and chestnuts will be one of the most popular too. If you are not in France for your Christmas dinner you can still have a wonderful Christmas meal with any of the following recipes which are just a taste of the holiday fare. 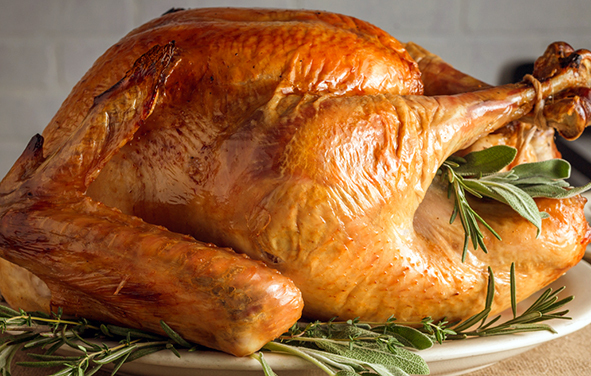 Turkey is one of the classic Christmas recipes in most countries and is popular with everyone. It is of course available all year round nowadays but you will find it especially abundant at Christmas time. Choose a bird that is white fleshed with short spurs and smooth black legs – these are the signs that the bird is young. Goose is definitely a French classic when it comes to Christmas and it is a shame that it is not as popular nowadays as it used to be. 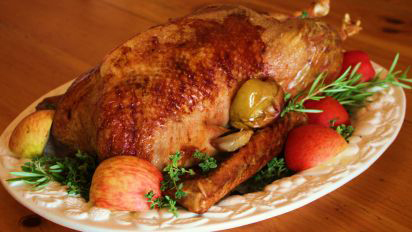 It is a most delicious bird and when cooked as in this recipe it is going to give you a wonderful Christmas dinner. Game is increasingly on the menu in many homes and restaurants and is absolutely delicious. 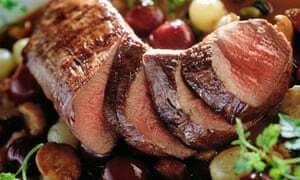 There are many recipes for game, but here is one for a beautiful dish of roast venison. Remember if you choose this recipe you will need to prepare the dish at least two days before you need it! All the above recipes can be served with your own choice of seasonal vegetables and there are so many to choose from at this time of year, with sprouts and chestnuts being one of many favourites. 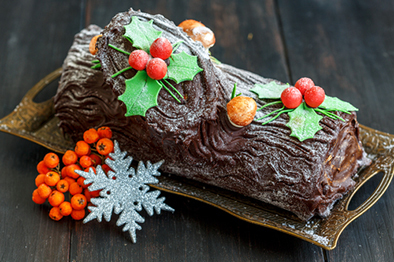 Christmas puddings, and of course cake, are also very popular but in France a more traditional cake is the Yule Log. This is a cake rolled in the shape of a log and decorated traditionally with chestnut purée, but nowadays there are many other flavours too that you can use instead. 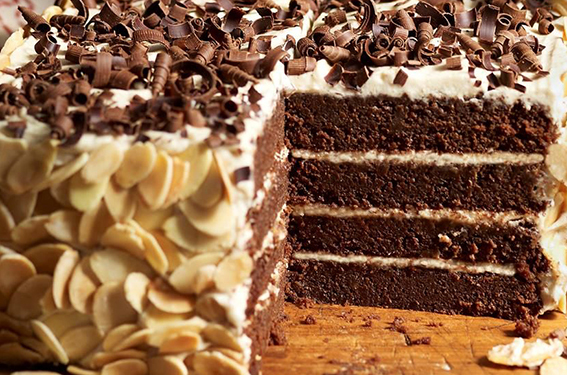 A really gorgeous and seasonal Chestnut Gateaux that will give everyone a welcoming treat when you present this on your table! It is so easy to make and it tastes divine. Great for Christmas or any special occasion. 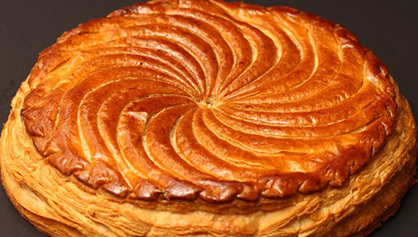 Every child in France waits impatiently for the 6th January (Twelfth Night) for the delicious spectacle of the Galette des Rois. This traditional dessert, said to have been created to honour the three kings who travelled to visit the baby Jesus in Bethlehem… but actually it is a load of old twaddle! It was really created in modern times by an opportunistic French pâtissier who saw the chance to make a profit! Nevertheless, it has a charm hidden in the cake and whoever finds it is king or queen for the day. 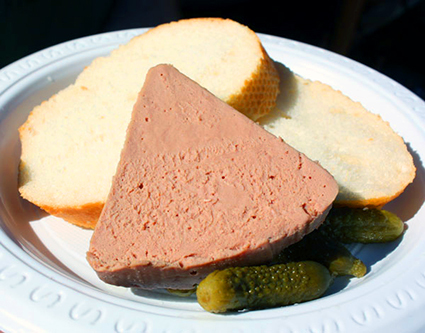 Christmas recipes really have to include some wonderful French paté which will give you the most delicious appetisers or hors d'oeuvres. They can be included for all your cold buffets and for a really delicious snack at any time of day!